Last week, I introduced you to ruffle fabric by showing you my upcycled ruffle pillows... pillows that had been quite useless, sitting in my basement until I made simple pillow cases for them using ruffle fabric. I have a few more ruffle projects up my sleeve. 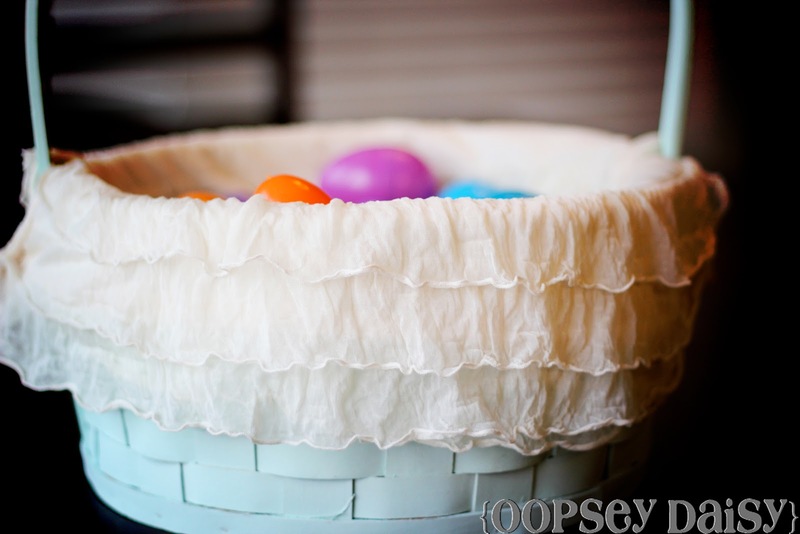 Come along and see how to make your own ruffled Easter basket liner! * I measured the circular part of the basket's base. This would be the bottom of the liner. 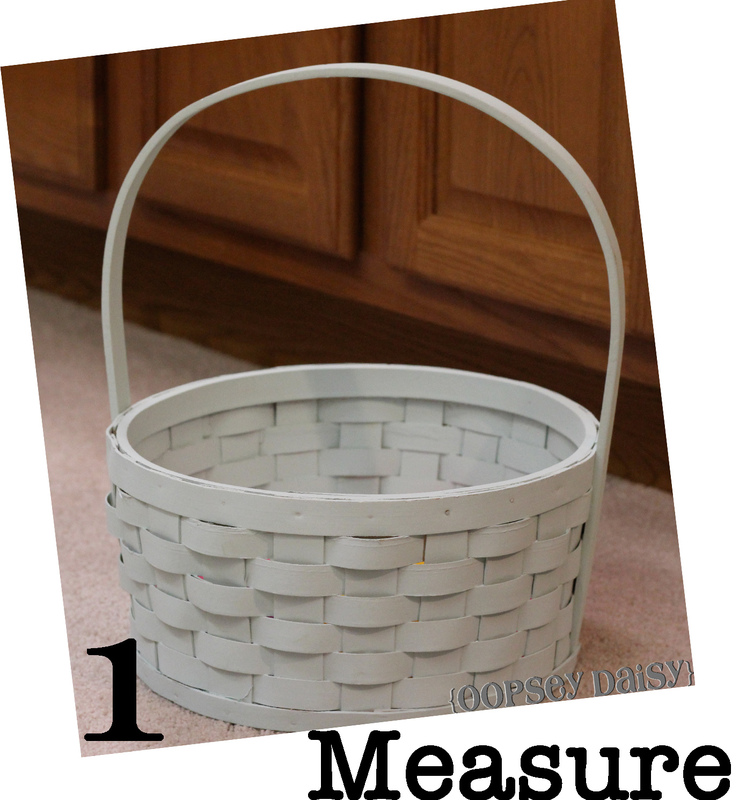 * I also measured the height of the basket's body, adding how much of the fabric I wanted to fold over the opposite edge. This would be the width of the strips. 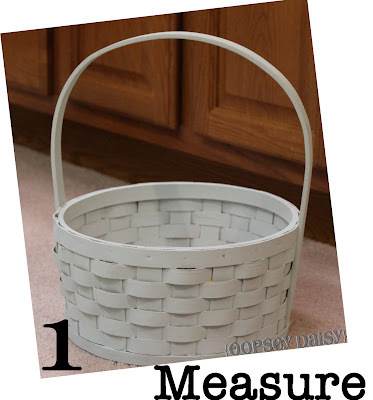 The circumference of the basket's bottom would be the length of the strips. To make my basket liner double sided, I needed 2 strips for the inside and outside. 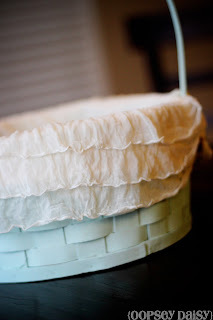 I used my measurements to carefully cut out the basket liner's bottom and the 2 long strips for the liner. 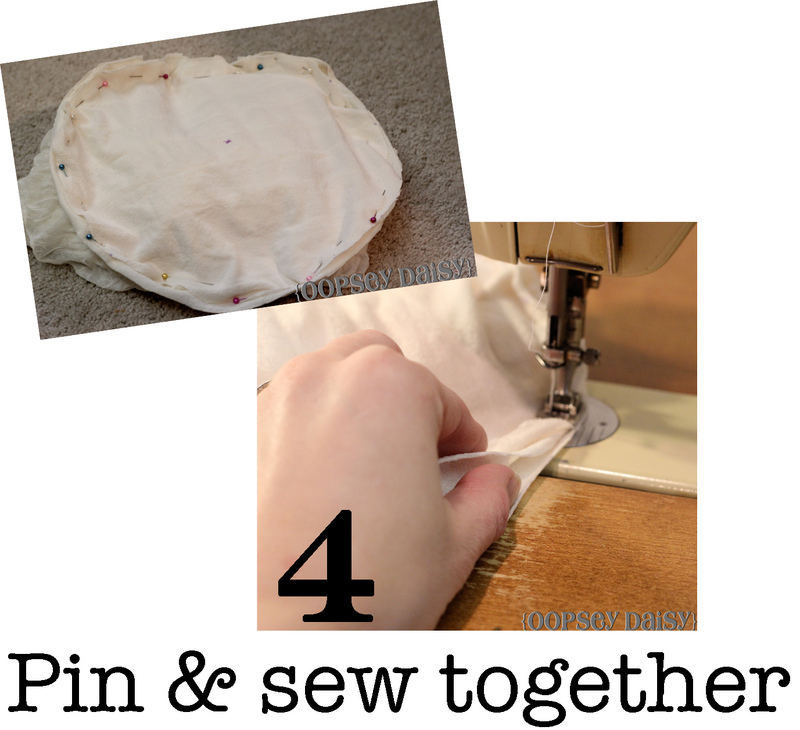 Now I pinned the double liner all the way around the circular fabric base, right sides together. I sewed very slowly around the circle, making sure to secure all 3 layers of this thin, sheer fabric. I needed some way to create openings for the 2 basket handles. I sewed up the double liner's final edge (creating a circle), but only part of the way. I left the rest of the edge open to wrap around the handle. I simply sewed on velcro to hold the liner closed. To create an opening for the opposite handle, I made a slit from the outside up to the handle. I hemmed the raw edges just slightly, and used velcro once again to hold it closed. Velcro is one of my favorite crafting supplies! I slipped on that lovely ruffly liner... absolutely blissful. But doesn't it look awfully empty. I dug the Easter eggs out of storage just to get the full effect. 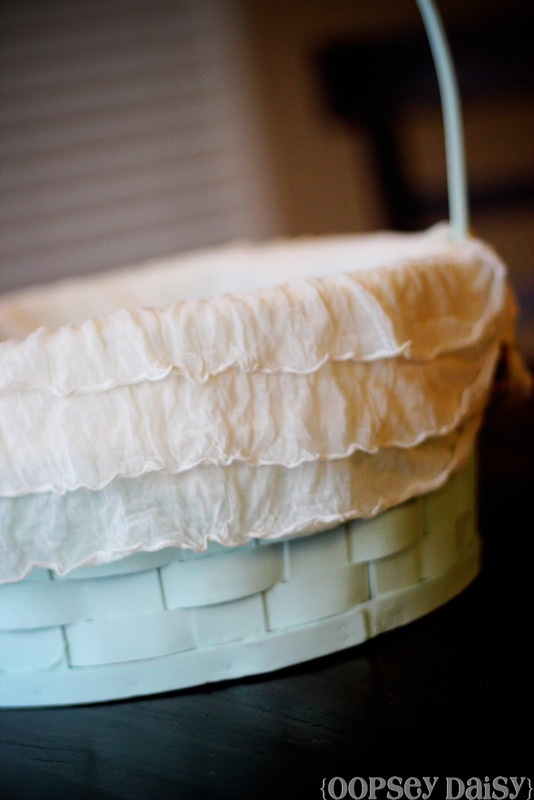 Don't forget that now is the time to order your very own ruffle fabric! 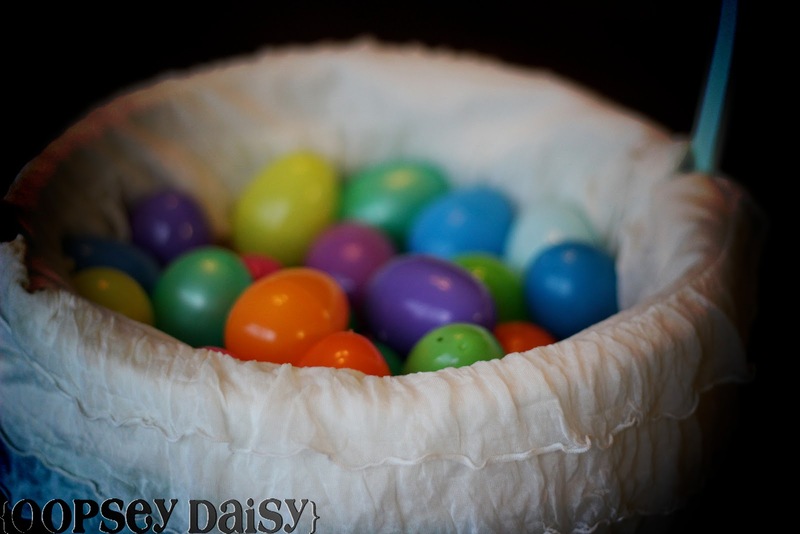 Ruffle fabric is offering Oopsey Daisy readers a 10% discount. Just enter promo code "Daisy" at checkout! This offer is only valid for 1 more week! If you have made something using ruffle fabric, please send me some pictures. I love it! Cutest thing!! I love and appreciate your ideas! they are amazing! Super cute! I love the vintage look it give the basket. Very chic! This fabric looks like a LOT of fun! that looks adorable, something like this would be so expensive at a store. It's such a cute idea. I'm having a giveaway! come by when you can. 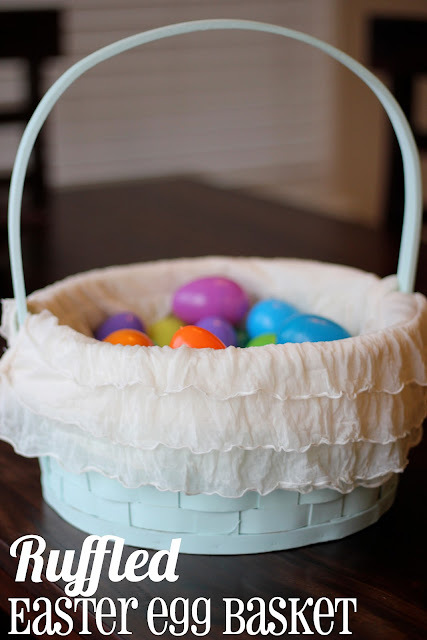 This looks adorable, great idea for jazzing up the basket! A woman named Kellie follows your blog. I am guessing you don't know her story. On Feb. 17th she was teaching kindergarten when she got the worst call of her life. Her 4 month old baby died in the care of the babysitter. Kellie is a wonderful woman who needs our help! If you could see her blog and feel inspired, it would be amazing if you could do a post about the auction they are doing on this coming Monday, the 28th. They are trying to raise enough money to (in the future) have another child and be able to stay at home with them full-time. Kellie and James didn't deserve what happened to them. Could you please help out a wonderful family in need by posting the link to the auction on your site? Thank you. I just love your blog and have awarded you the "Stylish Blogger Award"! I hope you will accept! This looks great. Ruffles are so in right now. 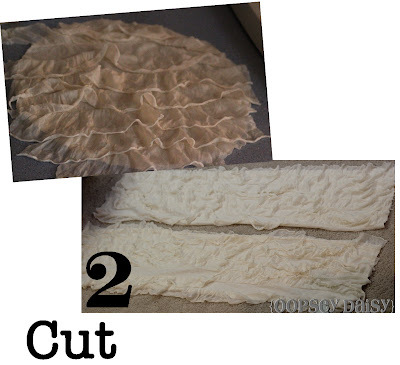 I'm loving this ruffle fabric that you keep showing where can I find it? That's a great idea! I missed this post. That's really cute. 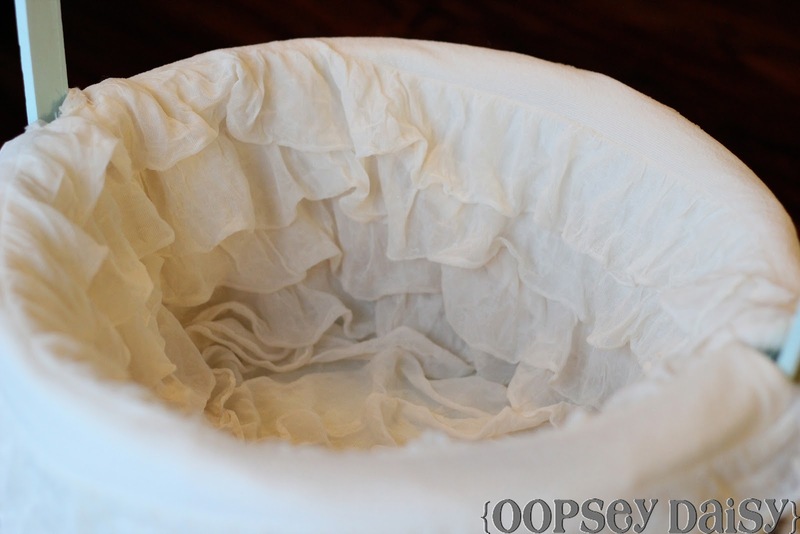 I have some ruffle fabric I'm trying to decide what to do with and this seems like a great idea…now to get a basket…..